Sony's new high-concept Cyber-shot QX lens cameras may look like a gigantic lens you place on top of your smartphone screen—which, oddly, you actually can do. 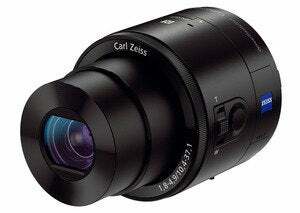 But in reality, each of the two models, the higher-end QX100 and the smaller but farther-zooming QX10, is a standalone camera that will fit into a decent-sized pocket all by itself. The real advantage with these lens cameras—announced at the IFA consumers electronics show in Berlin—is that you can use either one with your smartphone to shoot photos with excellent image quality and resolution, in effect transforming your smartphone into a high-quality point and shoot. Designed for a photo-active lifestyle, this fusion product is targeted to smartphone shooters who enjoy that shoot-and-share convenience but want better pictures. And indeed, if you're toting this camera, image quality should not be a concern: With the QX100, we're talking about a 1-inch, 20.2-megapixel CMOS sensor, an f/1.8-4.9 aperture lens complete with image stabilization, and a still image ISO of 160-6400. Despite its tiny size and unusual form factor—the QX100 measures 2.5 x 2.5 x 2.25 inches at 6.3 ounces fully loaded—its optics are top notch. It derives its 3.6x zoom Carl Zeiss lens from the Cyber-shot RX100 II, Sony's top-of-the-line $750 compact camera. The QX100 also has a dedicated control ring for adjusting manual focus and zoom. The 18-megapixel QX10—at 2.5 x 2.5 x 1.3 inches and 3.7 ounces—has a f/3.3-5.9 Sony G lens, a 1/2.3-inch CMOS sensor, a much longer, image stabilized 10x optical zoom, and a still ISO range of 100-3200. This facilitates high-quality shots from an even greater distance. This model also offers Program Auto, Intelligent Auto, and Superior Auto modes. The lens camera attaches to the phone with a bracket. 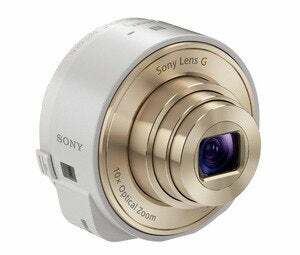 A spring-loaded bracket attaches the Cyber-shot QX camera directly to your phone, and you use the Sony PlayMemories Mobile app for iOS or Android both as a viewfinder and as a remote control to start and stop movie recording, focus on a subject, zoom, and trip the shutter. Both models shoot image-stabilized full HD video in 1080/30p with output to MP4 format, and they save still images to both the smartphone and the camera's own memory card. With this camera, you can actually hold the device in your hand or set it on a tripod and shoot without the phone. It has an independent rechargeable battery, memory card slot, and shutter release. While these little lens cams can go solo in a pinch, if you need a specific shot, you'll want to use your phone as a viewfinder. These Cyber-shot QX models have both Wi-Fi and one-touch NFC networking—the NFC connection works with most Android phones while the Wi-Fi connection works with iOS phones. Once shot, pictures can be shared immediately. Both cameras will be available later this month. The Cyber-shot QX100 will be available in black for $500. The QX10 will be available in black or white for $250. Updated on September 5 with video from IDG News Service.